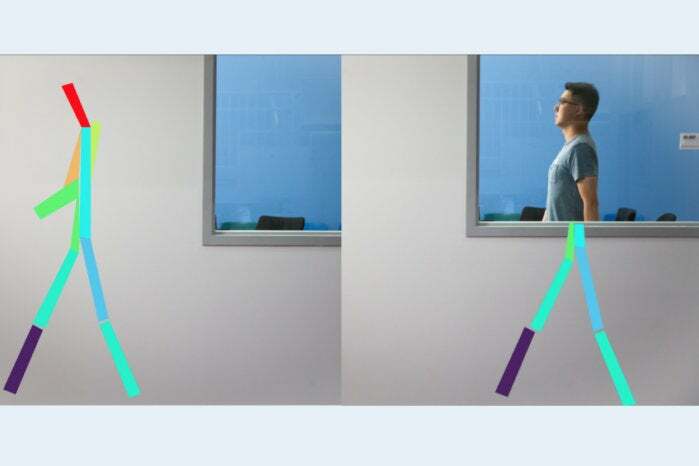 The creepy RF-Pose system developed by MIT's CSAIL can track a person through walls or identify one specific person out of a group of 100 people. MIT has created a system likened to X-ray vision, but the AI can track a person through walls — or identify one specific person out of a group of 100 people — by using wireless signals. MIT’s Computer Science and Artificial Intelligence Laboratory (CSAIL) calls it RF-Pose. Yeah, that’s not creepy at all. How could they ignore the blaring red alert of potential privacy and spying issues and continue to develop artificial intelligence (AI) that can monitor a person’s movements through a solid wall using wireless radio waves? Apparently for its potential use in healthcare. The CSAIL minds behind RF-Pose are currently working on 3-D output instead of the current 2-D stick figure output. 3D could show “even smaller micromovements,” such as seeing “if an older person’s hands are shaking regularly enough that they may want to get a check-up.” They see it as a plus that patients would not be required to wear sensors or to charge devices.